Blue counties won by Teasdale. Red counties won by Bond. 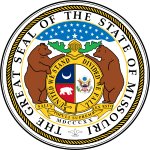 The Missouri gubernatorial election of 1980 was Missouri's 45th gubernatorial election. The election was held on November 4, 1980 and resulted in a victory for the Republican nominee, former Governor Kit Bond, over the Democratic candidate, incumbent Governor Joseph P. Teasdale, and Socialist Workers candidate Helen Savio. This election was the second in which Kit Bond and Joseph Teasdale faced off, and the third consecutive Missouri gubernatorial election in which Kit Bond was the Republican nominee. ^ "MO Governor Race - Nov 02, 1976". Our Campaigns. Retrieved 2013-02-10. ^ "MO Governor Race - Nov 07, 1972". Our Campaigns. Retrieved 2013-02-10. ^ "MO Governor Race - Nov 04, 1980". Our Campaigns. Retrieved 2013-02-10. This page was last edited on 17 December 2018, at 20:54 (UTC).